Lexington Animal Hospital is proud of our professional and courteous staff! We have deep veterinary experience and a passion for animals. We would love to meet you. Dr. Meghan Gick Ryan was raised in Arlington, VA. She received her undergraduate degree in Biology from Georgetown University in 2006. Dr. Ryan attended veterinary school at the University of Pennsylvania and graduated in 2010. 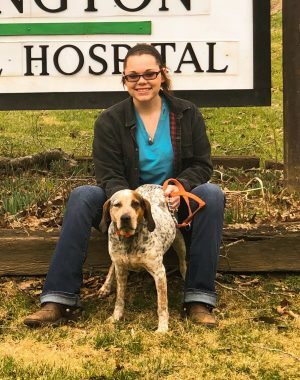 She completed a rotating small animal medicine and surgery internship at the Regional Veterinary Referral Hospital in Springfield, VA, where she developed a love of emergency medicine. 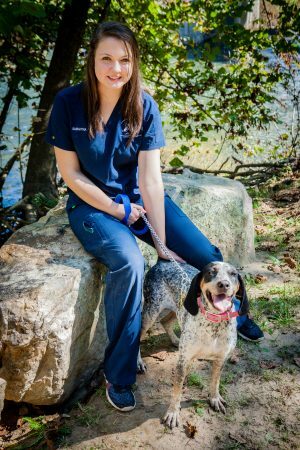 Since completing her internship, Dr. Ryan has worked as both a general practitioner and an emergency veterinarian in New York, Pennsylvania, and Maryland. Dr. Ryan enjoys surgery, internal medicine, dentistry and emergency medicine, as well as building relationships with her patients and their families. 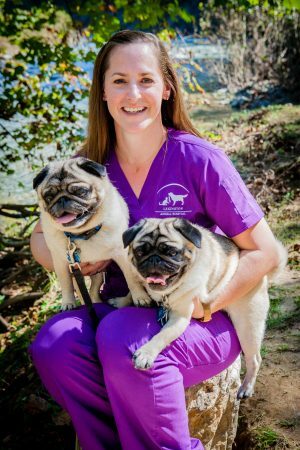 Dr. Ryan is a member of the American Veterinary Medical Association, the Virginia Veterinary Medical Association, and the Blue Ridge Veterinary Medical Association. 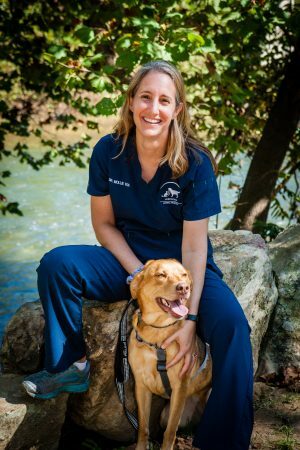 Outside of veterinary medicine, Dr. Ryan enjoys spending time with her husband David, daughter Anna, son Danny, her cat Gunner (aka Jinglebells), and her two dogs: Finn and Gil. Dr. Ryan loves all outdoor activities, especially kayaking, stand-up paddle boarding, cross country skiing, and hiking with her dogs. My furry family includes Sgt. Tibbs, the cat who enjoys wrestling with my husband, and Matilda, my feisty poodle mix that keeps everyone on their toes. My sons Cooper, Gibson, and Sawyer love the pets way more than the pets love them. When I am not working, my hobbies include hiking and photography. 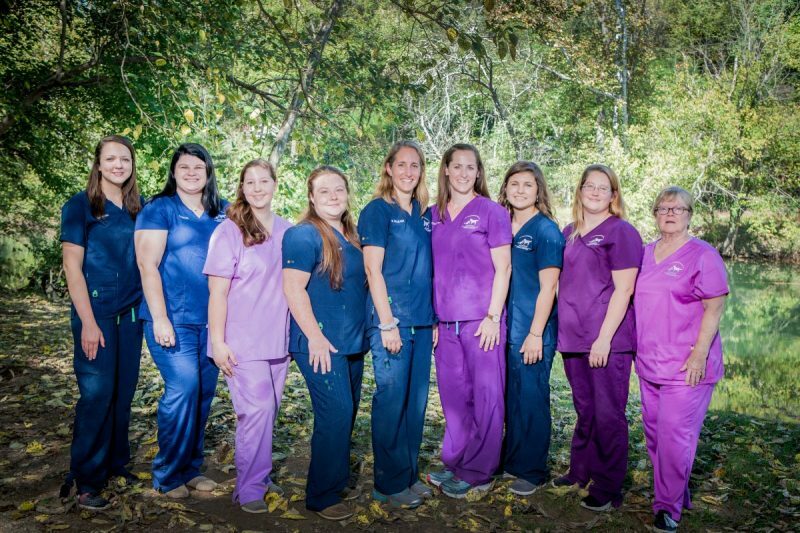 I am proud to work at Lexington Animal Hospital because we practice an excellent quality of medicine provided in a caring and compassionate environment. I hope I get to meet you soon! 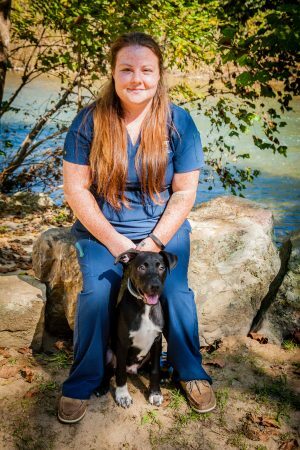 My name is Ashley Woodson, and I am an LVT (licensed veterinary technician). I started working at Lexington Animal Hospital in April 2013 as a kennel assistant. 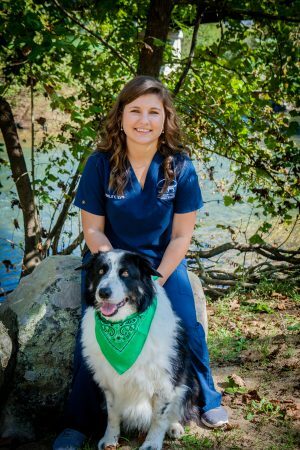 After graduating from Rockbridge County High School in 2014, I went on to complete my Veterinary Technology degree from Blue Ridge Community College in May 2017. Outside of work I enjoy kayaking, training for and running 5k's and obstacle course races, and barrel racing. My furry friends include 2 cats (for now), Oli and BK. Hi, my name is Heather Hall, and I am a 1999 graduate from Rockbridge County High School. I started my career in this field at the age of 14 with Dr. Showalter. I have worked in this field for over 20 years and I love it so much. I attended Blue Ridge Community College where I studied to be a veterinary assistant. At LAH, I handle all of the grooming, and you can often find me working the front desk. Outside of work, I am married to my husband Corey. We have 2 wonderful children, Makayla and Eli. I enjoy walking my two dogs, Xander and Kiara, and love camping with my family and dogs. Hi my name is Jessica Saunders, but everyone calls me Jesse. I’m a native of Rockbridge County and wouldn’t have it any other way. 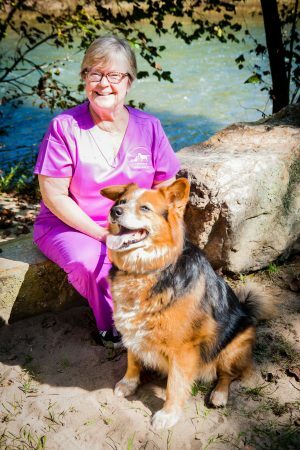 I came to Lexington Animal Hospital in 2012 as a Vet Assistant then worked my way to being that smiling face that greets you at the front desk! I'm your go-to gal when it comes to having questions, concerns or anything in between that has to do with your pets. I have an amazing husband, and three beautiful rambunctious children; Mason, Madison, and Olivia. Turn Up is my feline fur baby who is a spunky dilute calico who just turned up at LAH, and I recently adopted my lab-mix puppy Mack. In my free time I enjoy cooking, not baking haha! I enjoy fishing, reading, those Drive-in nights and family fun activities. I can't wait to meet you and your fur family at your next visit!!! Hi, my name is Nicole Moore. I have worked at Lexington Animal Hospital since August 2016. 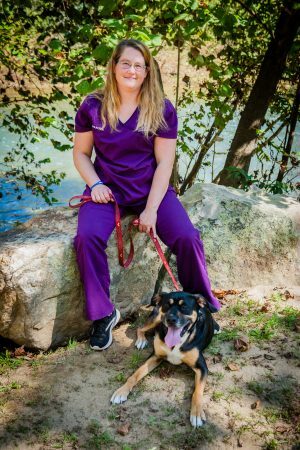 I have taken veterinary assistant classes at Rockbridge County High school, where I graduated in June 2016. My passion for animals came from growing up watching and taking care of stray cats at my house. I knew since then that my career would be with animals. Now I own a black chow chow mix named Duke (pictured), a little Chihuahua mix named Duchess, and a grey cat named DC. Outside of work I enjoy walking Duke and Duchess on trails, kayaking, and being with my family. My 4 year old nephew loves to have fun with me, Duke, and Duchess. Hi, my name is Kambray Wilhelm. I have been at Lexington Animal Hospital since December 2018. I am currently enrolled at Blue Ridge Community College where I am pursuing a career in veterinarian. I live on a small family farm with an assortment of animals. I have a yellow lab, a pitbull, a mini pot-bellied pig named Piggley, a paint horse named Vinay, a herd of over 30 Angus cattle, as well as a several bear and rabbit hunting dogs. In my spare time, I enjoy doing Liberty work with my horse, kayaking, hiking, spending time with friends, and exploring Virginia. I also really love to take cute photos of the patients at Lexington Animal Hospital. Samantha is a senior at Rockbridge County High School. She has been working here since Fall 2017. She enjoys spending time with her friends and family. She plans to go to nursing school after graduation and wants to focus on geriatric nursing. Marie was born in Virginia, educated in North Carolina and Texas, and spent most of her adult life in Texas. She raised her family in Texas, and worked as an executive assistant to C-level executives in several business disciplines for many years. Seven years ago, Marie drove to New York to retrieve a rescue dog from an unsuccessful adoption in Manhattan. On her way to return him to the original rescue in Charlotte, NC, she was snowed in and forced to spend the night in Lexington, VA. Seven years later, she and that rescue (Winslow) make their home in Lexington. She is Visitor Services Manager for Rockbridge Area Tourism, and a part time employee for Lexington Animal Hospital. Brianna is graduated in 2018 from Rockbridge County High School. 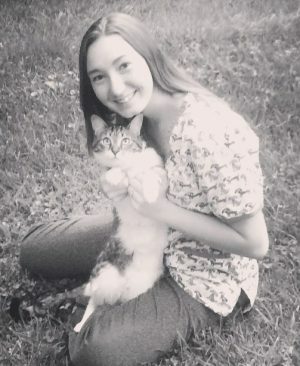 She now attends Radford University and helps take care of the boarding pets. She originally lived in North Carolina and moved into the county in June, 2013, because her father was hired at W&L to head the music department. Her home includes her mom and dad, her older brother, two goofball mutts (Lucy and Holly), a sassy calico cat named Butterscotch (pictured), and an adorable kitten named Macaroon that she adopted from a litter born at LAH. There are also several fish and their tanks which she maintains regularly. 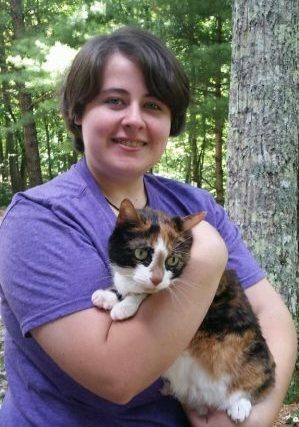 She's had experience pet-sitting when she was younger, and previously worked in crafts at an after school program in Central Elementary. She aims to earn a geology degree and become a paleontologist after college. 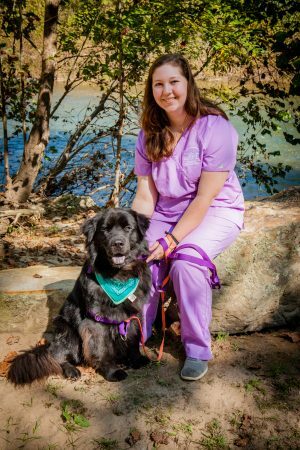 Hi, my name is Kelsey Hostetter and I've been here at Lexington Animal Hospital as a veterinary assistant since July of 2014. I graduated from Rockbridge County High School in 2016 and began attending Longwood University to receive a degree in elementary education with a concentration in special education. Choosing my career path was not easy; I love working with animals, as well as children. Here at the hospital you'll only see me during the summer months and near Christmas, but you'll probably find me in the front desk or running around with a dog in my arms cleaning! Leaving to go back to school is always a bittersweet day as I love my job and caring for your pets. Pictured is my feisty two year old boy, Oakley. I also have a 6 year old chihuahua that is not very photogenic. I love my fur babies dearly! As a Rockbridge county native, I enjoy fishing, hunting, kayaking, cooking, and spending time with children and pets. David is from Duncannon, a small Appalachian Trail town in Pennsylvania. He left home for "travel and adventure" in the Army shortly after 9/11, and now works for Devil's Backbone Outpost in Lexington, VA. 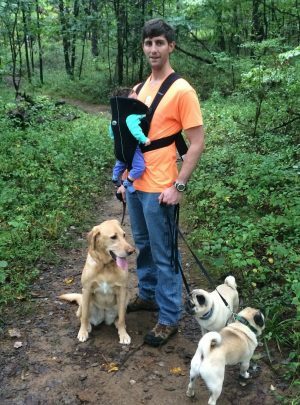 Growing up he had a lab and a German Shepherd, but has graduated from that to a veterinarian wife, a toddler daughter, an infant son, and two pugs. You'll find him in the hospital on evenings and weekends, trying to help out and not break things.